We decided on the Great Wall at Badaling. Although a bit further than some of the other sections, it is longer and wilder. On the bus the tour guide gave us a potted history of why the wall was built (to protect food and people from nomadic invaders), how the wall was built (forced labour in lieu of taxes), where the wall was built (surrounding the areas with more than 400mm annual rainfall). The main aim was not so much to keep the invaders out as to signal where help was needed by lighting beacons at the watchtowers. Then the adjacent garrisons will send reinforcements. She was rather apologetic that the wall we would see was only recently built in the Ming Dynasty, and that we would not be able to see any of the original earthen Qin wall. Ming is good enough for me, with its dark grey stones and white mortar, smooth walls and vertiginous steps. Getting off the bus we were met with icy winds which left us breathless. 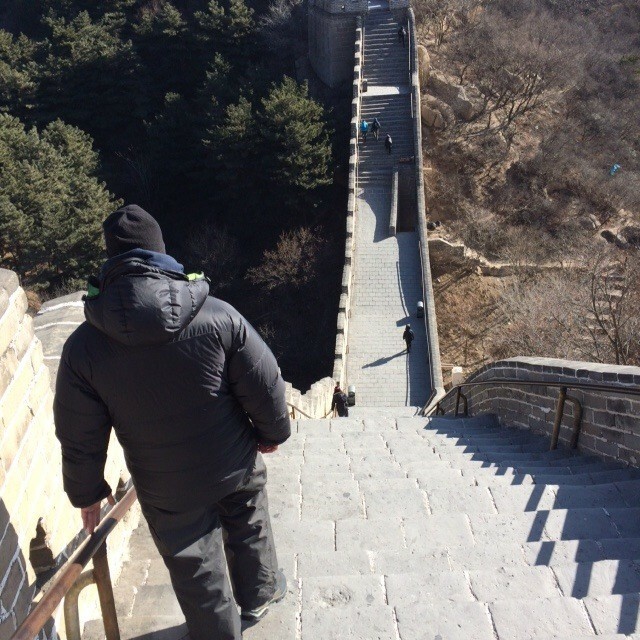 Walking past the bear pits, stunt camel, and endless stalls selling commemorative medals and masks against the wind, we headed off to Walk the Wall. I recently made the mistake of “fondly” recalling doing burpees in class back in the 80s. I had read that these were one of the most gruelling of exercises as they work the entire body with no muscle group having a chance to rest. Their mention reintroduced them to the next class, for which I tendered an apology to the class. As we are now in Winter training, they are not on the current menu but will no doubt reappear for Summer training. Anyway, the reason for this little digression is to explain that I now know what burpees are for – Walking the Wall. The terrain is endlessly varied, shallow steps, steep steps, slippery slopes going up and down – the only thing missing was horizontal space, apart from the brief respite of the watchtowers. I tried imagining what it must have been like to live here and run in armour, but I have to admit it was beyond my ability. To see a beacon lit in the distance, or see the plume of smoke calling for assistance. At last a rest at the watchtower at the top. A few of us were up there, regaling ourselves with artisan dark chocolate and ginger tea – most civilised. It looked mostly downhill back from here, but that was a whole new challenge. 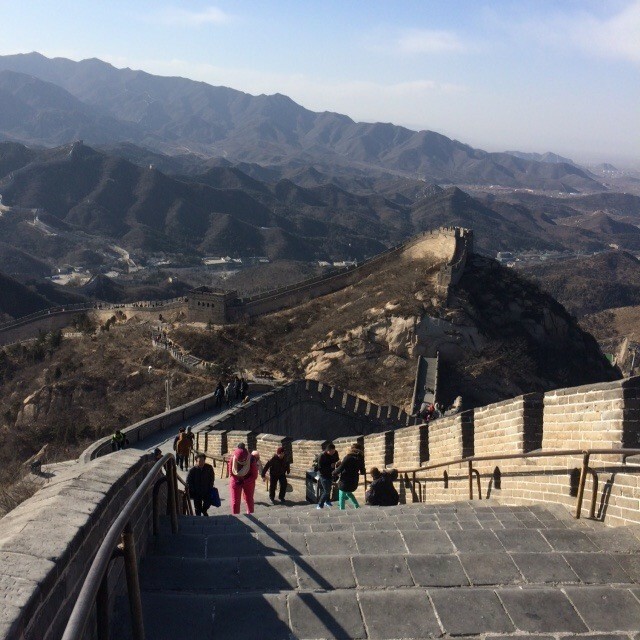 No doubt the handrails now at the Wall were not installed during the Ming Dynasty. Some of the more treacherous slopes had a handrail going down the centre. What followed was the best ever game of snakes and ladders, except the snakes were the winners. Ever slid down the banisters at school? Well you would love it here. Having tried a couple, we moved on to filming our efforts, going faster and faster. Then we tried bunny hops up the steps. I doubt you ever did that at school! One brave soul tried bunny hopping back down the steps, as I tried to hold the camera still and hope he didn’t go face down. All back safe to the bus, exhilarated by the experience. Go there – the Wall really does look like a dragon snaking along the mountainous contours. The sudden gusts of wind take you off your feet. The cracked and worn stones tell their own tales of hardship, fear, courage. Back towards Beijing and decided to try to see the Temple of Heaven. Lunch was nothing to writ home about, so I won’t. The Gods that rule the traffic in Beijing decided that we were not fit to see the Temple, and some didn’t make it on time. The gates were being closed just as we got there, and we were allowed to look through the gap for a few moments. The park is much used by residents to play games of cards and Chinese chess. What sounded like the Blainau Ffestionog choir was practising in one of the cloisters, accompanied by a trumpet and an accordion. Heavenly. To pass the time waiting for the bus in the sub-zero dusk, we decided to have a look at “The Seven Meteors” as shown on the park map. These turned out to be neither seven nor meteors. Oh well, the Wall will have to be enough joy for one day.